Paradise Seeds Original White Widow female produce a cannabis plant with photoperiod genetics and a flowering time of 8-9 weeks. Original White Widow has an effect described by the breeder as ‘Strong, mighty’ and a taste that is ‘Floral, pine’. 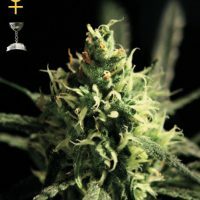 Buy Paradise Seeds Original White Widow female at the lowest price online now! Original Classic… Original White Widow (IBL) is pure old school all the way. An explosive combination of sativa and hybrid genetics from Brazil and India that yields big and hits hard. This is classic bud, 50/50 sativa/indica, with a popularity that has endured over the years. As the story goes, this plant harnessed the power of a super sativa Brazilian land race together with a resinous indica from the mountainsides of Kerala in southern India. We were given a female clone way back in 1996 and have been breeding it with a carefully selected White Widow male plant since then. A consistent component in some of our crossbreed plants, bringing quality enhancement, in 2012 we decided it was time to share the original strain in its purest form. Our In Bred Line is strong, a lineage that comes all the way from the original champion strain, developed by our old friend Ingemar, known by many as ‘The Father of the White Widow’. This powerful plant takes its name from the Black Widow spider, dangerously potent, in combination with the thick coating of white crystals that cover its resinous buds. Expect the characteristics that have earned this plant such a solid reputation for its commercial capabilities. A sturdy plant, growth patterns are uniform, becoming bushy early on before stretching when in flower. This variety is a great fit for SOG, SCROG, LST and other forms of plant training, making it ideal for cultivators working with limited space. The many side branches produce fat tops, exploding with trichomes, which emanate its floral odour. A gift to indoor growers thanks to a consistency that gives ease of control in a grow room and a harvest that will fill your basket after 8 – 9 weeks flowering. Easy to grow, this strain is the choice of beginners and experienced pros. Outdoors it will reach for the sun (2m and more) and yield accordingly, which makes it a great choice in the southern regions of the world. However, as a true champion, this plant will also perform very well in more moderate climates of northern Europe and Canada. Not for the faint hearted, Original White Widow (IBL) will deliver a dose of potency that can catch even the most experienced smoker by surprise. While this bud is half sativa it’s the pure power of the indica bite that takes hold of mind and body. Yield: 500 g per m² indoors. 700 g per plant outdoors.